So, by now you may be wondering – who is actually writing these posts? To put a personal face on the blog, we’ll be gradually introducing some of our education staff and have them say a few words about what they do. 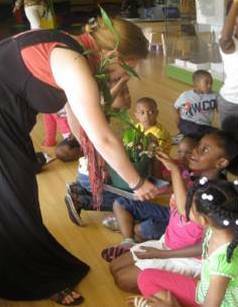 Here, I'm showing a group of 2nd graders a bamboo plant, to help them learn about Brooklyn Children's Museum's sustainable floors, made from bamboo. 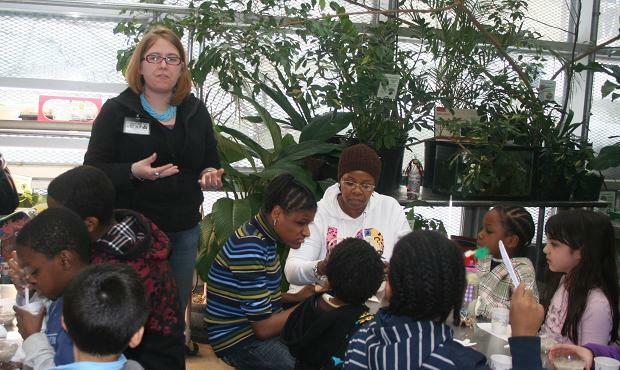 My name is Lynn Cartwright-Punnett, and I’m a science educator at the Brooklyn Children’s Museum. I work with public and school programs, teaching everything from geology to how to make homemade toothpaste. But my main focus is this project: teaching sustainability to young learners. Before joining the team at Brooklyn Children’s Museum, I worked at summer camps, after school programs, and taught 6th grade for three years. I have experience with grades PK to college, but I really like the incredible curiosity and eagerness of the youngest learners. I’m also a licensed New York City tour guide, and I love the opportunity to get New Yorkers of all ages to experience parts of New York City they’ve never seen before!